7 x 10 1/4 inches. August 1882 or July 1883. Ouless first visited the Ecrehous in August 1882 and went there again in July 1883. He produced a number of sketches of the islets and in 1884 published a booklet of auto-types titled "The Ecrehous Illustrated". The son of a Jersey auctioneer, Philip John Ouless was born in St Helier in 1817. He was brought up at 8 Royal Square but sadly, when he was 19, his father died of cholera and his mother the year after. He went to study in Paris around this time and for ten years seems to have lived and worked in Paris and Jersey. It was while in Paris that he met his wife Caroline and they had their first child Henry. 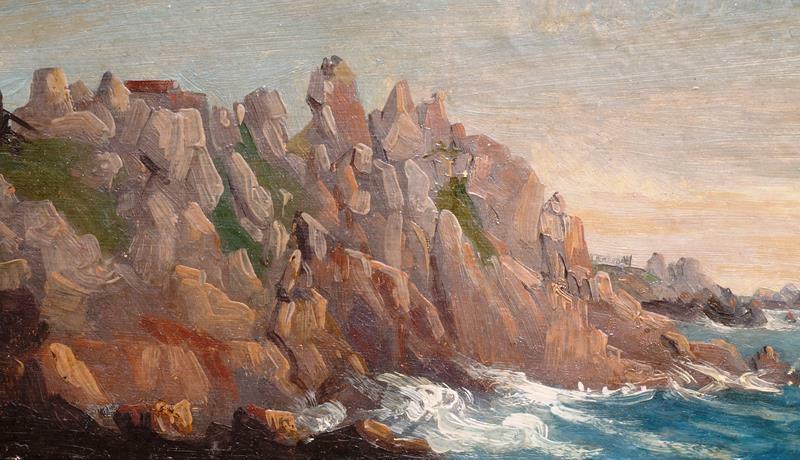 During these early years he produced mostly landscape and coastal views in watercolour and oils and he found a ready market among publishers who reproduced his views of Jersey and sold them as collections of prints to the increasing number of visitors to the island. The first of these was published by Philip Falle in 1840 titled the Scenic Beauties of the Island of Jersey. He also illustrated a number of books and derived an income from the sale of individual lithographs after major works such as his Gorey Races held on Grouville Common in 1849. He also recorded a number of events in the Island, particularly shipwrecks, for reproduction in engraved form for the Illustrated London News. To commemorate the visit of Queen Victoria to Jersey in 1846, he produced eleven watercolours, which were published in an album the following year. He was also commissioned to paint portraits. From the evidence of sketchbooks and studies recently discovered, Ouless made an extensive journey through the Rhine in the summer of 1845 and also made frequent visits to Brittany and Normandy between 1846-59. In 1847 the family returned to Jersey and settled at 53 Paradise Row, New Street where he advertised himself as a "portrait, landscape and marine painter". However, it was only after 1850 that he began his career as a ship portrait painter. Ouless's reputation for painting ship portraits quickly spread in the island and he received numerous commissions from ship owners and their masters for pictures of newly launched vessels, benefiting from the boom in shipbuilding during the 19th century. By the middle of the 18th century shipping provided the greatest source of wealth for the Island and patrons in the form of a powerful middle class of merchants and ship owners emerged. Although a few artists earned their living painting portraits most artists associated with Jersey in the 18th & 19th centuries were marine painters. Over the course of the 19th century over 700 vessels were built in Jersey and this provided the artist with ample opportunity for commissions. His reputation also spread outside the island and he attracted many commissions from ship owners on the mainland. Ouless usually showed the ship in profile and occasionally he produced pairs showing the ship in full sail on a bright day and another of the ship in rough weather. To meet the exacting demands of his patrons who were knowledgeable about the rigging of vessels, the set of the sails and other details Ouless put great emphasis on accuracy of observation. He also applied this rigour to his topographical views which today make them a reliable historical record of the island in the 19th century. Collections: National Maritime Museum; Jersey Museum & Art Gallery; Guernsey Museum & Art Gallery; Societe Jersiaise.